SOKE MASAHARU SAKIMUKAI, known also to many as Grandmaster M. Sakimukai, devoted his entire life to the martial arts: in practice, in teaching, in research, in the founding of Chintokan Karate-do, Hakushin Ryu Okinawan Kobudo, USA Jodo Federation - Beikoku Shudokai, Kenbukan Iai-do, World Martial Arts Research Association, and Sakimukai's Ryukyu-Te Kyusho Jutsu. Soke Sakimukai was a "San Do Judan Hanshi;” he received 10th degree Black Belt and the title "HANSHI" in three Martial Art forms. Soke Sakimukai also received Mastery of Budo (samurai art) scrolls. SMR Jojutsu Menkyo (Mastery of the style scroll) from 26th Shindo Muso Ryu Jojutsu Head Shihan, Ichizo Otofuji in 1991. Only Shindo Muso Ryu "Menkyo" issued outside of Japan by Shihan Ichizo Otofuji and Shihan Takaji Shimizu. Mugai Ryu Iaihyodo Menkyo Kaiden (the highest license in a scroll system) from 15th Soke Hosho Shiokawa in 1995. Karate-Do Meijin (title for “an expert beyond masters) in 2010, from Soke Shiokawa (Shito Ryu Karate). became "Kancho" (Headmaster) for Chintokan Karate-Do in 1969, when the Chintokan was registered at the All Japan Karate de Federation - Renbukai as Sakimukai’s own endorsed by 10 Dan Hanshi Zenryo Shimabukuro. became “Soke” for Hakushin Ryu KobudoKai, the style created by Sakimukai in 1993, recognized by Soke Hosho Shiokawa. In essence, our approach to the path of Budo is held in Soke M. Sakimukai's maxim and it teaches that the internal development supports the external traits. A practitioner of Budo must first focus on "the Inside," emphasizing strengthening of the mind, body and spirit, including managing emotions. Then, alongside this follows "the Outside," which include the laws of physics, range of motions, body composition, and so forth. Then, just like in the making of the masterpiece swords - eternal repetition: "Fold and Pound." Practice, practice and practice!!! This emphasis on internal development that grows from the study of Soke M. Sakimukai's Budo philosophy brings a sense of integrity, whereby ethical action and moral certainty develop within the students. 10 Dan Hanshi Zenryo Shimabukuro, the Founder of Seibukan, a student of Shorin-Ryu (Sukunai Hayashi) Chotoku Kyan. Soke M. Sakimukai, Founder of Chintokan Karate-Do, Ryukyu Te and Hakushin Ryu Okinawa Kobudo. 1943 - born January 25th, in Kagoshima, Japan. 1962 - opened the original Chintokan Karatedo dojo in Jyuso, Osaka, Japan. 1991 - relocated Chintokan World Headquarters to Jacksonville, FL (Merrill Road, and then San Jose Blvd.). 2005 - Soke built the current dojo for the Chintokan World Headquarters on Sunbeam Road in Jacksonville, FL. 2010 - passed on his torch on July 10, in Jacksonville, FL ... His legacy continues. Soke Sakimukai's first martial arts exposure was basic Judo training at very young age, taught to him by his father, Masaichi Sakimukai, before entering elementary school. At age seven, upon entering school, he began formal training in Judo. A few years later, in the same elementary school where many school children engaged in after-school activities such as Judo, Kendo and other sports, young Sakimukai witnessed, for the very first time, a man practicing Karate. This man was practicing a kata. Young Sakimukai was both mesmerized by the art he was witnessing, and surprised to see this new found martial art did not require a partner to train. Already during the early 1950s, in the small town of "Chiran" in Kagoshima prefecture, where young Sakimukai was born and spent his early childhood, Sakimukai had been finding that his Judo had reached a level where he had no peers – no one in the small town could compete with or challenge him. Added to that, he had always felt that training with a partner was restrictive, with too many variables. Finally, though, he had discovered the art of Karate, where he could train wherever and whenever he desired, without waiting for anyone to show up. "I could practice all by myself," he thought. So young Sakimukai made the decision immediately to pursue Karate. In 1957, at age 14, young Sakimukai began his first formal karate training at the Shorinji Ryu Renshinkan dojo under Soke Tamotsu Isamu. He continued training there for the next four years, and received 2nd Dan. The Renshinkan dojo was the first Karate dojo known to be established in the Kagoshima prefecture. Although young Sakimukai stopped Judo training, he continued to live by the principles of Judo’s founder, Jigoro Kano's Budo way, categorized into three parts: Rentai-ho, Shobu-ho, and Shushin-ho. Rentai-ho refers to the physical exercises, while Shobu-ho refers to two-person matches, and Shushin-ho is the cultivation of wisdom and virtue as well as the study and application of its principles in our daily lives. These principles, along with Okinawan Karate principles, as well as the Samurai tradition, make up Soke Sakimukai's Budo: A life long journey. In 1962, young Sakimukai decided to move from his little hometown in Kagoshima to the bigger and much more challenging city of Osaka. In Osaka, young Sakimukai met Shihan Zenji Shimabukuro of Seibukan Karate-Do (aka Chubu Shorin-ryu). Shimabukuro was a cousin to Hanshi Zenpo Shimabukuro (Okinawan Shorin Ryu Seibukan), and a nephew of the late Hanshi Zenryo Shimabukuro. Shihan Zenji Shimabukuro was Soke Sakimukai's first "Seibukan" Karate-Do teacher but they both also challenged each other like brothers. And, as they lived together as roommates, they would train after their day jobs and all night after class - whenever it was possible. Later, Soke Sakimukai was granted permission by his teacher to go to Okinawa to train under Shihan Zenji Shimabukuro's uncle - the aforementioned Hanshi Zenryo Shimabukuro - at the Seibukan dojo. But before Soke Sakimukai was allowed to train under Hanshi Zenryo Shimabukuro, he was asked to leave and inspect other martial arts dojos on the Okinawan island. Hanshi Zenryo Shimabukuro wanted the young Sakimukai to be absolutely certain of his decision to study Kyan's Shorin-Ryu under Hanshi Zenryo Shimabukuro's instruction before young Sakimukai made the commitment. Young Sakimukai did as he was instructed, inspecting all of the dojos around, and when he returned to the Seibukan dojo young Sakimukai asked once more to train. He was finally accepted. After his chosen Karate-Do mentor Zenryo Shimabukuro passed on unexpectedly in 1969, Soke Sakimukai returned to his home state, where he began to expand the Chintokan Karate-Do organization he had started in 1962 with two partners (who subsequently left Sakimukai in charge). Before his death, Zenryo Shimabukuro had recognized Sakimukai as the founder of the Chintokan style. 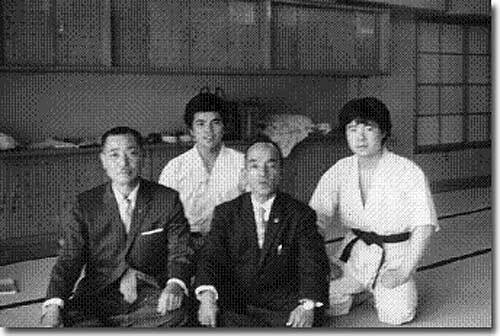 Soke added two dojo(s) in in 1970, in the cities of Amagasaki and Makurazaki. By 1973, he had added seven more Chintokan dojo(s) in the following cities or villages; Okayama, Tokyo, Nagoya, Kagoshima, Kaseda, Chiran, and Kawanabe. 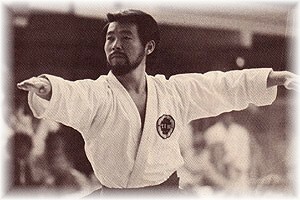 In 1976, Soke Sakimukai visited the USA for the first time and taught at Pennsylvania, Delaware, and Mexico Seibukan Karate-Do dojo(s) for three months. Three years later, in 1979, he visited the USA for another three months, teaching at the Pennsylvania, Delaware, and Florida Seibukan Karate-Do dojo(s). The next time, he thought, he would plan to move his family to the US. The following year, in 1980, Soke Sakimukai moved his family to Newark, Delaware, USA. Upon his arrival in the US, Soke Sakimukai began supporting the American Athletic Union (AAU)/USAKarate Foundation (USAKF), which was recommended to him by the chief director of the Japan Karate Foundation (JKF) at the time, Eriguchi Sensei. USAKF, under the leadership of the late Hanshi George Anderson (currently under Hanshi Patrick Hickey), was the National Governing Body for sport karate in the US at the time. In 1989, Soke Sakimukai became a prestigious International World Union of Karate do Organization (WUKO) Judge (currently this organization is called the World Karate Federation (WKF), and it is the International Governing Body for the Japanese "Kyogi" Karate, recognized by the International Olympic Committee. As an International WUKO Judge, Soke Sakimukai supported International Karate-Do competitions worldwide for many years.